The Offseason / Losing Streak "Split" is now available for purchase digitally via Bandcamp and on Transparent Electric Blue (limited to 125) and Transparent Kelly Green (limited to 125) vinyl via Barret Records, JUST IN TIME FOR CHRISTMAS YOU GUYS! 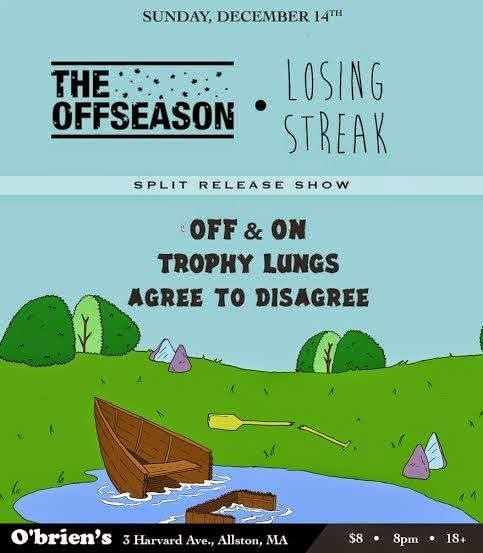 In celebration of the new album, The Offseason will be performing a record release show at O'Brien's Pub in Allston on December 14th with The Losing Streak (NJ), Off & On, Trophy Lungs and Agree to Disagree. 8p/$8/18+. Event details.